I love blueberries! They are pretty, sweet and a summertime treat. Every summer my family visits a little blueberry patch on the outskirts of town and we pick blueberries then feast on them in every way imaginable. My friends at the Blueberry Council shared this fun recipe with me, and I didn't hesitate to squeal with delight at the idea of sharing it with you. 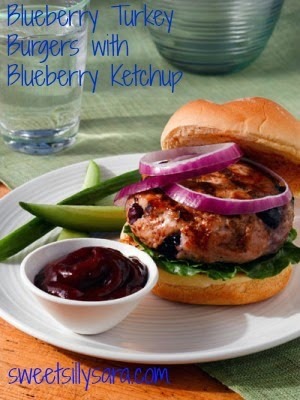 I love blueberries but I would have never thought to use them in a burger. What an interesting dish! Looks good. Thank you for linking at the In and Out of the Kitchen Link Party. Hope to see you again next week. This looks very interesting (in a good way) I'm also trying to find ways to use up the blueberries we got. I know my kids won't try this they are very picky. But I should be able to get the hubby on board. Thanks for a great recipe. Found your link at the Nibbles by Nic link party. Glad I did! Oh wow...what an interesting recipe! YUM!